The ‘National Register’ is a phenomenal source of information regarding historic homes. Search their database and you will find 49 properties as of July 12, 2018. 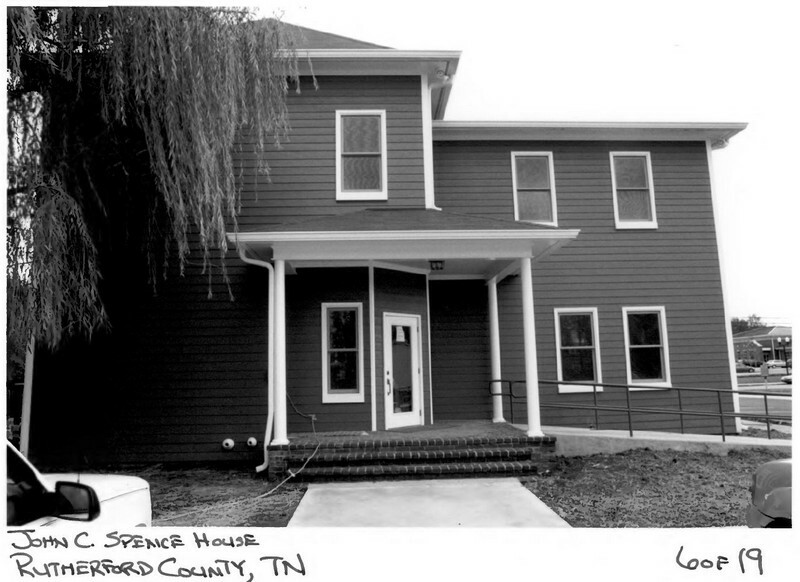 The John C. Spence House is located three blocks north of the downtown square at 503 North Maple Street in Murfreesboro, Rutherford County, Tennessee. Designed as a four-square vernacular interpretation of Queen Anne-style architecture, the house currently contributes to the aesthetically pleasing streetscape of North Maple Street’s Victorian era homes. 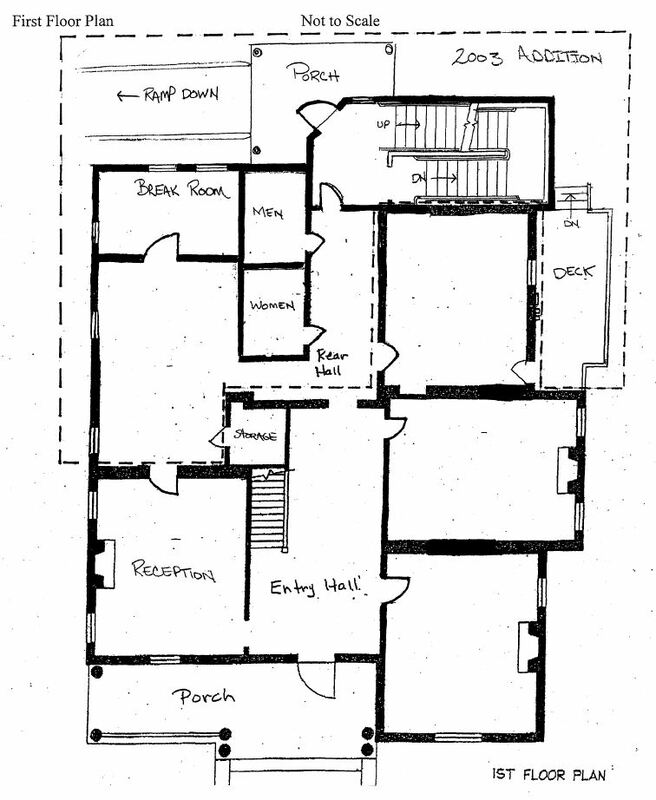 The Spence House has a center hall plan with a parlor on each side of the hall, dining room and office in the rear, and another office, restrooms, break room/kitchen and back stairs in the 2003 addition. The second floor has two offices on one side of the hall and one on the other. In the 2003 addition there are two offices and restrooms on one side of the hall, a door to the back stair, and one office on the other side of the hall. The house sits on a 1.1-acre level lot. The front yard is separated from the sidewalk and street by an original 1866 fence composed of seventeen stone obelisk-shaped posts connected by plain cast iron rails and balusters (C). 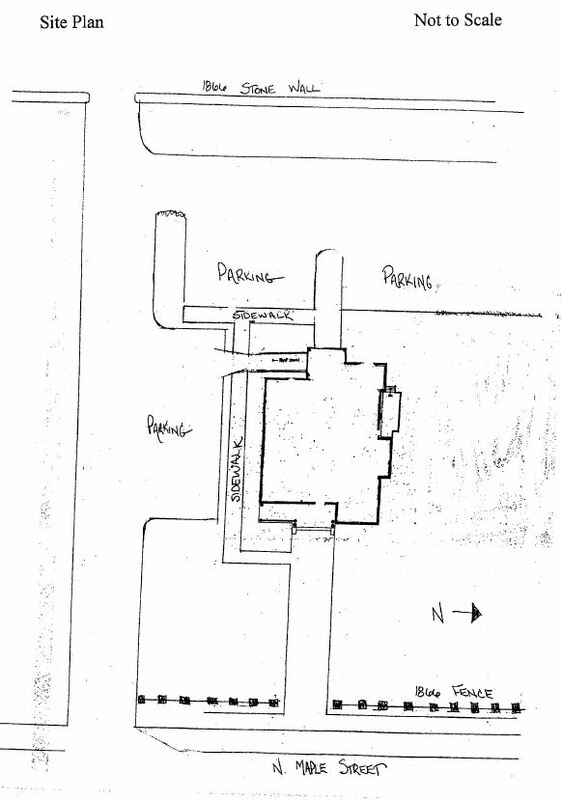 The west property line is bounded by an approximately six-foot limestone wall, original to the house (C). This wall separates the back yard from Walnut Street. A driveway leads through this wall into a small parking lot in the back yard. A parking lot abuts the property to the south with a residential lot to the to the north. section of the north elevation and two on the south elevation. Windows on the brick part of the house all have limestone lintels. porch might, it does give an impression of the popular nineteenth-century style. On the first story facade (east elevation) of the ell is a large single light window with a decorative leaded glass transom. Over this window on the second-story is a one over one double hung sash window that is larger than those on the rest of the house but matching in size the opening of the window below. All the windows on the house are one-over-one double hung sash windows with the exception of the facade window with the decorative transom on the ell. The south elevation contains two sections, the historic brick portion and the new frame addition. The brick section has two one over one double hung sash windows separated by the chimney. All the windows in the brick section have limestone lintels. The 2003 frame addition is two stories in height, though not as high as the original brick section. There are three one-over-one double hung sash windows on the first story and two one over one double hung sash windows on the second story. one on each story. The recessed (southern) portion contains a pair of one-over-one double hung sash windows on each story. Two brick steps lead to the covered porch. A handicap ramp with simple round pipe handrails runs east to west across the southern portion. two one-over-one wooden double hung sash windows spaced over the door and window on the first story and a one over one wooden double hung sash window between the levels. A 2003 wooden deck spans the masonry section of this bay with square balusters supporting a plain board handrail. 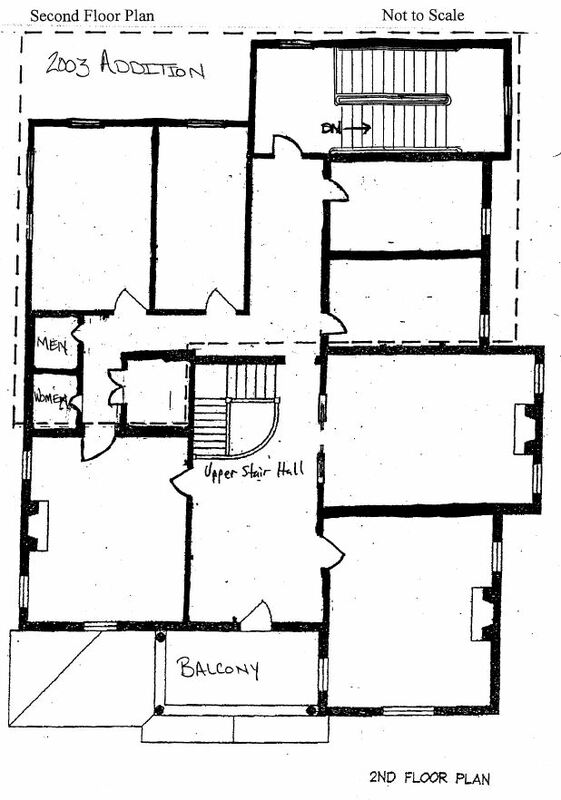 The floor plan of the house is a center hall with rooms on the north and south. The hall runs from the front of the house west through the frame section. The hall narrows as it enters the frame portion. On the first story there are three principal rooms to the north of the hall and one large principal room to the south. The second story has four principal rooms to the north with two principal rooms on the south separated by a cross hall and two side-by-side bathrooms. Each room in the masonry section on both stories has a fireplace with a simple mantel composed of pilasters supporting a shelf trimmed in crown molding totaling six in all. All of the mantels are 2003 replacements to the missing originals. The window surrounds are comparable to the mantels with similar simple pilasters framing the windows and a recessed panel below the sill, while the baseboards have molded trim. The woodwork in the frame addition is similar to the masonry portion. The floors in the masonry section are the original pine, which were uncovered and refinished in the 2003 rehabilitation. The floors in the 2003 frame addition are covered with carpet. An L-shaped stair covered with paneled wainscoting reaches the second story. The square newel post has recessed panels on the base, while the cap has simple molding as trim. Turned balusters support a wooden handrail. Smaller square posts on the landing and second floors separate the balusters. The rail curves at the top and is open to the first story below. There is a second enclosed carpeted stair in the 2003 frame addition. The building is currently used as law offices and has recently undergone rehabilitation following the Secretary of the Interior’s Standards. The approved rehabilitation included removing a dilapidated addition and replacing it with the current addition, removing modern partition walls, and updating the mechanical systems in the building. The neighborhood the John C. Spence House is located in contains both residential and commercial properties. The town square is a few blocks south of the house and to the north and east are residential properties which exhibit many Victorian era and early-twentieth century I-houses, Queen-Anne, and bungalow styles. 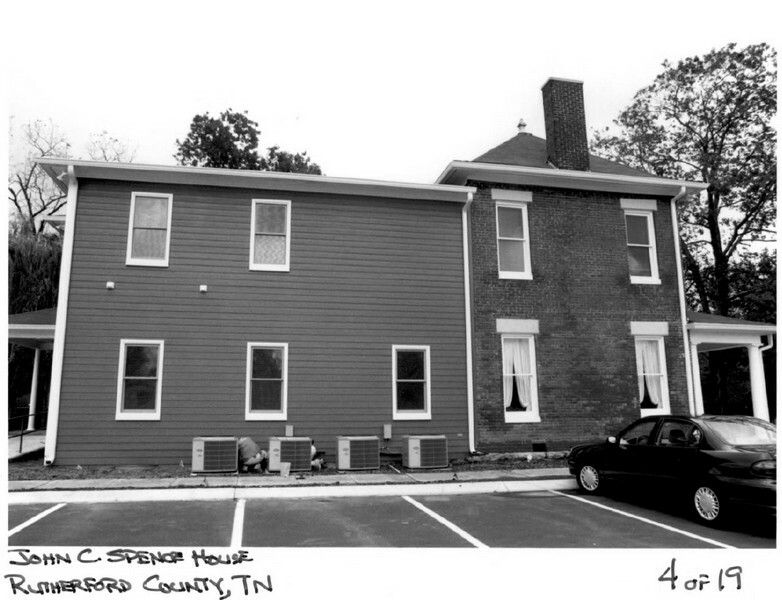 The Spence House has had various uses and appearances during its time on North Maple Street. The 2003 rehabilitation and current use as law offices have allowed the house to be restored to its former beauty. Inevitably there have been changes to the house, but overall, the Spence House retains integrity while exhibiting use over time. 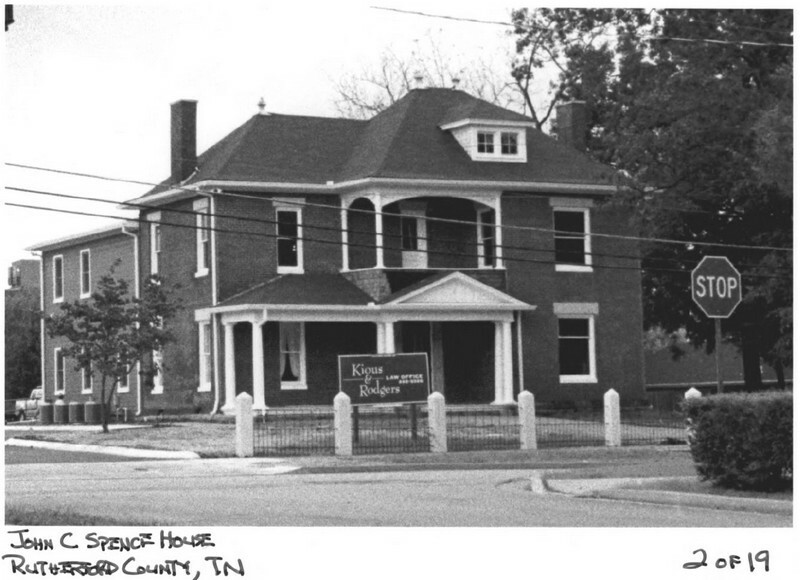 The John C. Spence House at 503 North Maple Street in Murfreesboro (population approximately 69,000), Rutherford County, Tennessee, is eligible for nomination to the National Register of Historic Places under Criteria B. 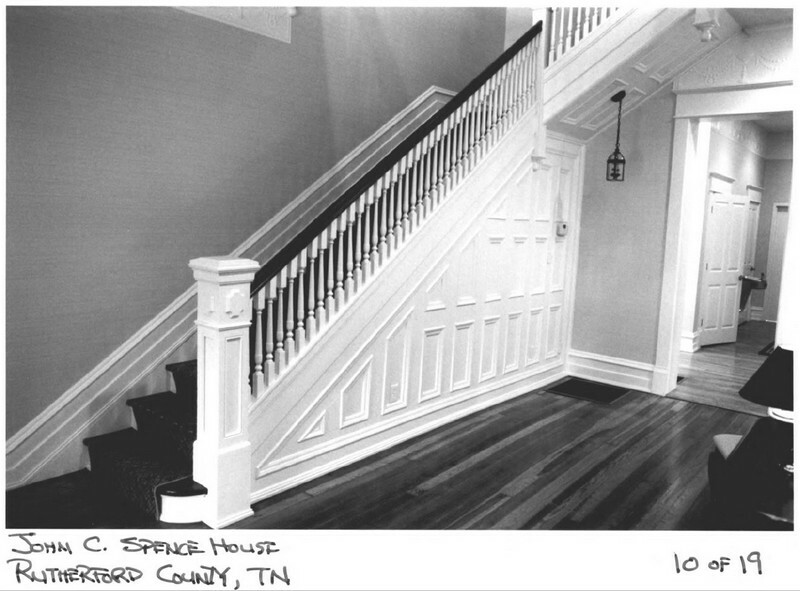 The property meets Criteria B for its association with John Cedric Spence, a prominent nineteenth century Murfreesboro businessman, industrialist, and important chronicler of county history. Spence, while living in the house, wrote his important volume on local history, Annals of Rutherford County: Volume Two, 1829-1870. The Annals detail the political, social, and economic life of Murfreesboro in the middle of the nineteenth century. Built at an unknown date, the house was moved to Maple Street in 1866 and Spence lived there until his death in 1890. 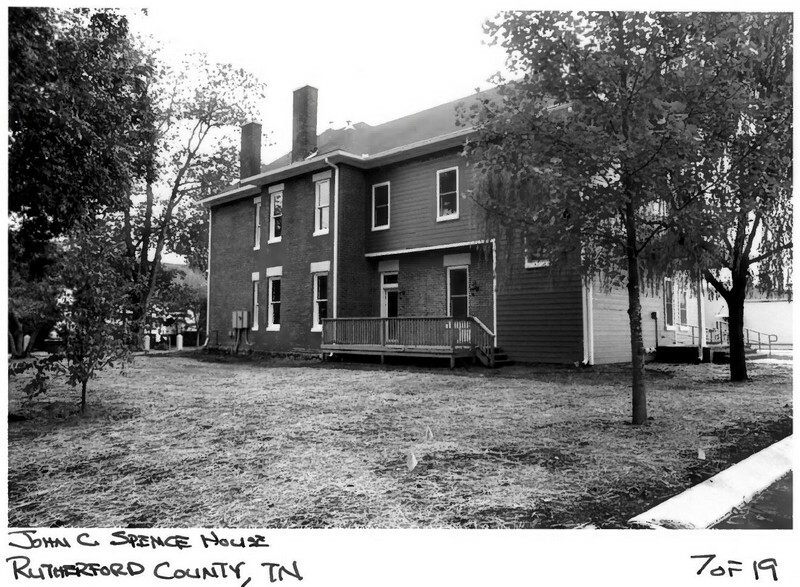 During this time Spence operated a hardware and grocery store on the square in downtown Murfreesboro and built the Cedar Bucket Manufactory, Rutherford County’s first mechanized industry. The house is characterized by its massive two-story brick construction decorated by Queen Anne style wood trim and front porch. 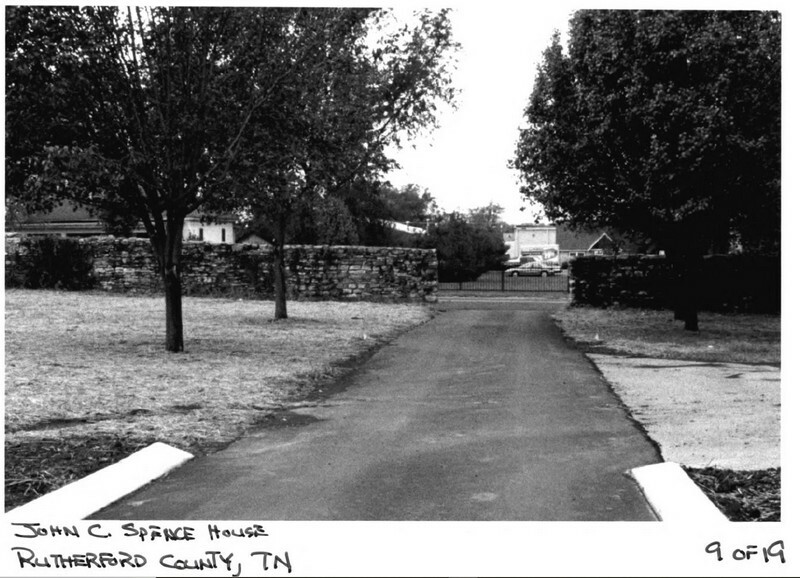 No other extant buildings in Murfreesboro are associated with Spence. Moved to 503 North Maple Street from its original location somewhere on nearby College Street in 1866, Spence and his family lived in the house until 1890. The exact date of construction for the house is unknown. The house and its location on what was once a very fashionable street is a reflection of Spence’s firm position within Murfreesboro’s growing middle-class during the mid-nineteenth century and his ability to take advantage of local business opportunities, even during the lean years of the Reconstruction. 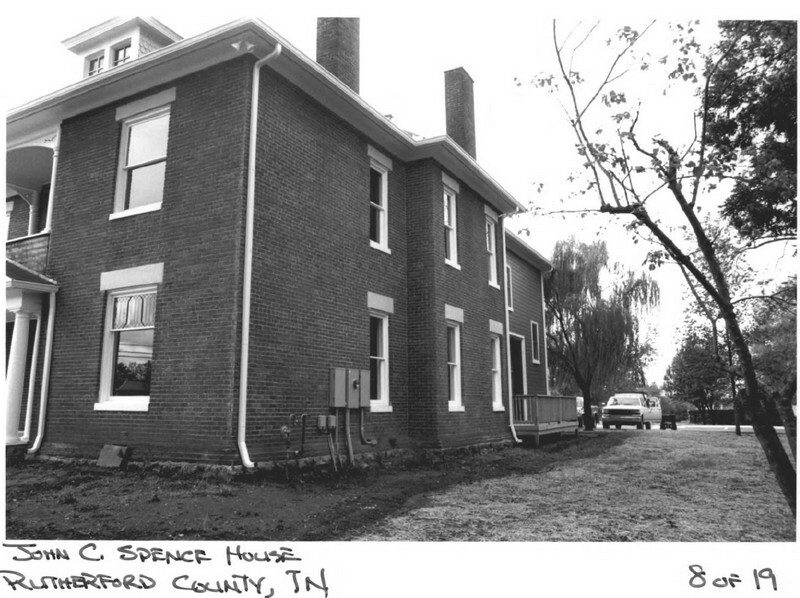 Spence operated a successful hardware and grocery store on the downtown square and, aided by the coming of the railroad, eventually financed two of Murfreesboro’s earliest mechanized industries in the 1850s. Perhaps his most important legacy, however, is the two-volume set, Annals of Rutherford County: 1829-1870, the preeminent source for mid-nineteenth century history in Murfreesboro. This book provides to historians a window into the economic, social, and political history of Murfreesboro and Rutherford County at the time as well as a unique look into the life and personal values of Spence, one of the town’s elite businessmen. The plot of land on which the Spence House is located was originally part of an extensive 4,620-acre land grant that belonged to Revolutionary War veteran Captain William F. Lytle. William inherited the land grant from his brother, Archibald, who had received the land in return for his services as a Lieutenant Colonel in the Revolutionary War. Archibald died before he ever had a chance to see the tract. William Lytle and his family moved to his deceased brother’s land ca. 1800 and were some of the county’s earliest settlers. In 1811, Lytle donated the original sixty acres of land on which Murfreesboro was established as the Rutherford County seat. No extant buildings are known to be associated with William Lytle’s settlement. ideal for an entrepreneur like Spence, who likely enjoyed the privacy and status that his home offered. While not the finest or largest Victorian-era house in Murfreesboro at that time, it was representative of the city’s emerging middle class businessman’s desire to own an elegant and tasteful home situated somewhere between town and country, away from the bustle of downtown, but close enough to allow easy access to his place of business. The house is one of the largest houses on North Maple Street and is similar in style and workmanship to many other Victorian-era homes in Murfreesboro, such as those located in the town’s East Main Street Historic District (NR 7/11/1985). The facade of the house retains its original Queen Anne wood trim and shingle work, as well as a partial wraparound porch. Both of these elements, as well as its massive two-story brick construction, evoke the construction and decorative trends of the late nineteenth century residential architecture. Born in Murfreesboro in 1809, Spence was a successful local businessman in the years leading up to and after the Civil War. By the time Spence moved into the house at 503 North Maple, he had achieved many of the goals he set as an entrepreneurial businessman in the decades leading up to the Civil War. In 1850, when the census indicates he was 41 years old, he opened a grocery and hardware store, probably located on or in the immediate vicinity of the downtown square. The 1850 census lists Spence’s real estate holdings valued at $1,000. No items or values for his personal property were listed. By 1870, Spence had quadrupled his personal wealth, employed a personal servant for the first time, and bought a fashionable new home that he and his wife had moved to 503 North Maple Street. John C. Spence is best remembered as a successful downtown grocer and hardware store owner in the mid-nineteenth century, the founder of the Cedar Bucket Manufactory in 1854 – Murfreesboro and Rutherford County’s first mechanized industry – and as an avid chronicler who penned the Annals of Rutherford County: Volume Two, 1829-1870. The Annals is a journal-like, year-by-year record of Rutherford County’s political, economic, and social affairs during the middle of the nineteenth-century. Although the book presumes to discuss the whole of Rutherford County, most of the book’s information is centered on the town of Murfreesboro. The volume is most notable for Spence’s unique perspective on, and enthusiasm for, the modernization of Murfreesboro after the Nashville-Chattanooga railroad came to town in 1851, and for his portrayal of town life during and immediately following the tumultuous years of the Civil War. With a foothold in the local economy, Spence was ready in 1850 for “The most important business” of the year: Murfreesboro’s “subscription of stock to the rail road.” In addition to inspiring his own business initiatives, “The prospect of a Rail Road, coming to Murfreesboro, causing business men to be looking round for a greater improvement. Changes commenced taking place.” Throughout his writing about the decade of the 1850s, Spence’s record emphasizes the profound improvements to the economy and general quality of life that the railroad brought to the people of Murfreesboro. As in many parts of the nation, the mid-nineteenth-century development of the railroad in the South provided small, agriculturally based towns like Murfreesboro the opportunity to connect with far away economic markets and urban cultural centers. Farmers and merchants like Spence now had the ability to sell their crops and material goods outside their insular communities and the immediately surrounding countryside. In Spence’s own words, the railroad created a new breed of “bold, enterprising” businessmen, “not hesitating making a ten or twenty thousand dollar trade, more than formerly a one thousand dollar transaction.” Through his Annals, Spence provides modern readers with the unique opportunity to place Murfreesboro’s mid-nineteenth century economic changes into the larger context of the history of the railroad and its revolutionary economic effects across America. While the Annals allows one to place Murfreesboro in the context of American railroad history, the book also illustrates how Murfreesboro’s local culture changed during these years. According to Spence, not only was “the general view of business expanding” in the early 1850s, but also “The old rural habits of the people were undergoing a change, such as house raisings, log rolling, corn shucking, quilting frolics and dancing parties. These times were ended.” Progress from a backwater farm town to a modern economic and cultural center necessarily entailed education for Rutherford County’s citizens, the significance of which Spence did not miss: “Places where the old school houses standing, now supplied with academies and other institutions of learning, where the arts, sciences, languages and a general knowledge of things are taught.” Spence’s explicit enthusiasm for Murfreesboro’s modernization reflects nineteenth-century Americans’ faith in technology, progress, and civilization: “Thanks to inventive genius, a new era now dawning.” Very few other records exist that so colorfully illustrate Murfreesboro’s history and culture in the middle of the nineteenth century. With expanding economic markets and the flowering of local culture, Spence introduced Rutherford County’s first mechanized industry in 1854. His Cedar Bucket Manufactory took advantage of one of Rutherford County’s most plentiful, yet under-appreciated, natural resources: cedar timber. In the very same chapter on 1866, Spence briefly mentions for the first time a “Foundry and Machine Shop” that was “started and conducted by Jno. C. Spence before the war. At the time that war was going on all the tools and materials belonging to the shop, were destroyed by the Federal soldiers.” This short passage is the only mention of Spence’s foundry, which does not appear to have reopened after the war, and illustrates that he attempted more than once to take advantage of the opportunities made available by new technologies and economic markets. hardware “merchant,” but there are no indications that he made any more attempts at industry. Census data indicates that Spence remained a storeowner at least through his sixty-first birthday in 1870. No information is available on his activities between 1870-1880. By the time he was a seventy-year old man in 1880, however, Spence had retired from the retail business. During the year after the Civil War, Spence’s wife, Elizabeth, purchased the vacant lot at 503 North Maple Street from their son-in-law, William Roulet. The Spence’s ability in 1866 to buy and move a large, fashionable house to the family’s new property illustrates that, unlike many wealthy southerners, John Spence had maintained his financial success into the years following the war. By 1870, when Spence was 61 years old, his real estate holdings were valued at $3000 and his personal estate at $1000, four times the amount listed in his 1850 holdings. As an additional measure of Spence’s post-war wealth, the 1870 census indicates that he employed and housed a forty-year-old black female servant, Mary Maney, who also had a seven-year-old son, Stephen. By all accounts, Spence never owned any slaves prior to the war, and Mary appears to be Spence’s first residential servant. In the decade following the Civil War, Spence likely enjoyed writing the last chapters of his Annals as an aging man in the comfort of personal wealth and a large, tasteful home at 503 North Maple Street. consideration not necessary to be named” on July 26, 1932. The house stayed in the Moore family until James C. sold the house in 1935 to George and Lucy Brown.26 Very little is known about the Moore family or their tenure at the Spence House. According to John Womack, husband of Lucy Brown’s daughter, Katherine, James A. Moore was a brick and concrete contractor and is responsible for the construction of the roughly six-foot tall brick wall that once defined the southern property line. On June 6, 1935, the Spence House was bought by George and Lucy Brown from James C. and Elsie W. Moore. Similar to Spence, George Brown co-owned a hardware store on the north side of Murfreesboro’s downtown square called Byrn and Brown Hardware. Five years after they bought the house in March of 1940, the Browns divorced and George left both the hardware business and Murfreesboro. In the divorce settlement, Lucy acquired sole ownership of the house and converted it into an apartment building in order to generate an income for herself. then sold the property to her daughter and son-in-law, Molly and Roger Teague, on June 5, 1981. The Teagues resided in the house until 1985, when a foreclosure put the property back into Lucy Brown’s ownership. 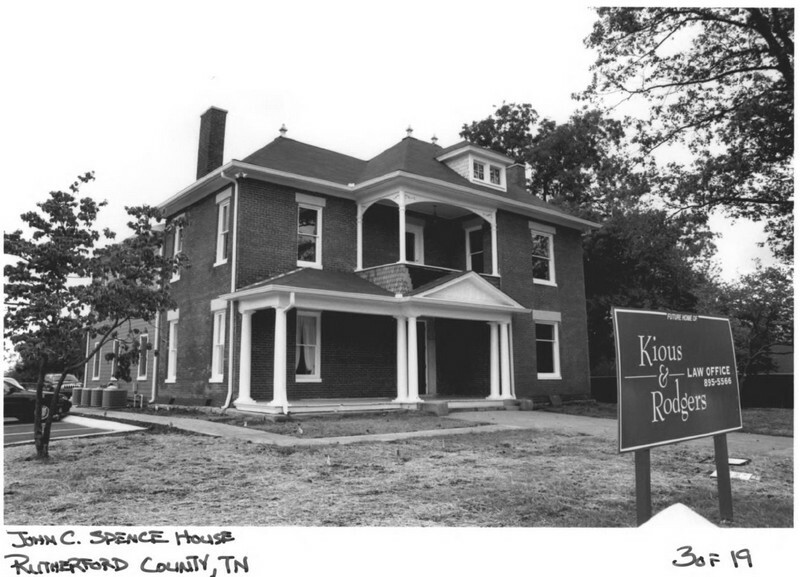 On August 11, 1986, Brown sold the property to the Children’s Discovery House Museum. The museum made several changes to the interior of the house to make room for children’s activities and exhibits. Most notable among the changes, the fireplaces were sealed and mantles removed throughout the house. The museum also commissioned large murals for several walls in the house that have since been painted over. The current owners of the property, Kious and Rogers, PLLC, bought the house in 2001 and renovated it to house their law firm in 2003. During the renovation, the law firm removed the deteriorating ca. 1941 rear addition and replaced it with a new addition that stretches slightly farther back into the yard than the original. They also uncovered where the mantles should have been and unsealed the fireplaces. While the structure has a large frame addition on the rear it retains integrity from the period of when Spence was in residence. On the exterior this is seen in the front porch with sawn cut decorative wooden shingles, the windows, especially the large leaded glass window on the facade. On the interior, the original baseboards and window trim, the pocket doors and the decorative paneled stair in the center hall. The exterior and interior of the masonry main section retains the appearance from when Spence was in residence. 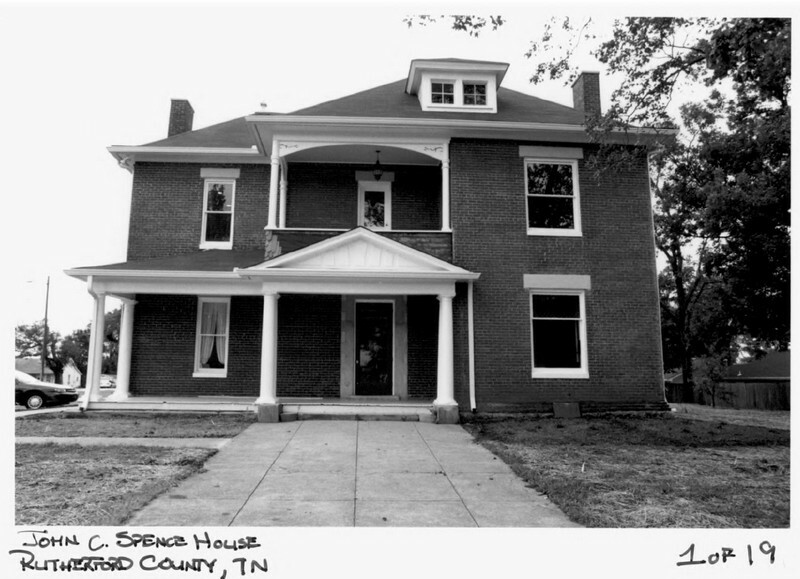 The Spence House is a visually impressive and historically significant landmark in Murfreesboro, Tennessee, and is eligible to the National Register of Historic Places under Criteria B. 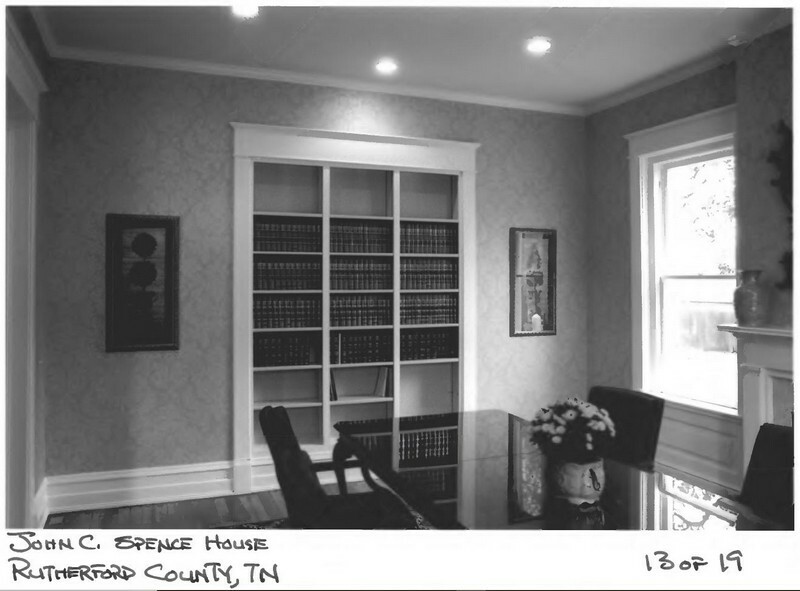 The wealth of information in Spence’s Annals of Rutherford County: Volume Two, 1829-1870 reveals much about Rutherford County’s history in the mid-nineteenth century as well as Spence’s own personal accomplishments and impressions of the quickly changing world around him. This record is an invaluable primary document that relates a year-by-year development of Murfreesboro during one of the city’s, and one of Spence’s, most significant periods of growth and development. 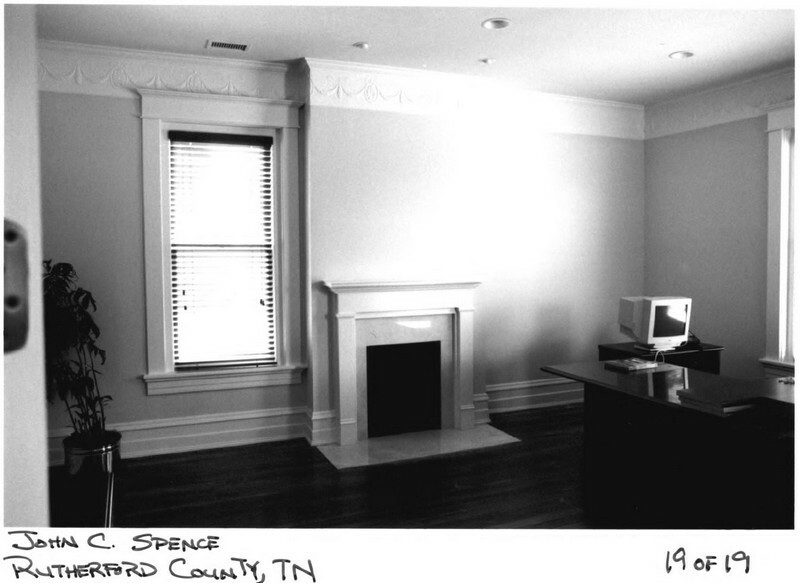 Spence’s volume allows readers the unique opportunity to peer into the modernization of Murfreesboro through the eyes of a successful southern businessman. John C. Spence was a prominent businessman and industrialist during the middle and late nineteenth century when he lived at the house, which is the only known extant property associated with him. Although there have been some changes to the building since Spence resided there, it is still, fundamentally, a building he would recognize as his home.